The adult division Scarborough 432 in Toronto will host a guest from the Heart and Stroke Foundation to speak about heart attack, congestive heart failure and stroke on Monday Feb 17 2003 at 1930. We'll be covering general descriptions, signs/symptoms and first-aid (but you should know this already). The meeting format will be informal with hopefully lots of questions. 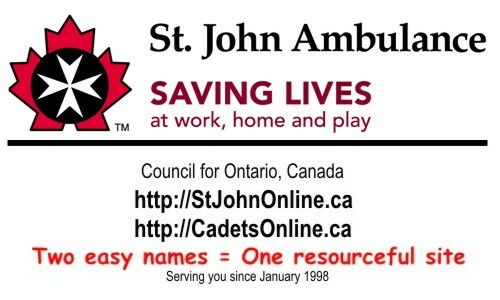 We invite all St John Adult and Cadets divisions to come along and learn with us. Maybe the cadets can teach the old dogs in the adult divisions a thing or two? We will meet at the Knob Hill United Church, 23 Gage Ave (South east of Midland/Lawrence), Scarborough on Monday Feb 17 2003 at 19:30 for about 2 hours. Dress is casual. The meeting will be held in English. There will be no marching drill. If you are interested please let me know if you are coming so I have enough handouts for everyone.